If you’re a golfer and crave the challenge of a well-designed desert course or just love the beautiful, sloping fareways of a traditional course, then you’re in luck! Tucson and southern Arizona have them all. Not only does southern Arizona boast some of the world’s best-designed courses, it also has some of the most spectacular golf properties available anywhere in the world. And, look for that fact to only get better! One of the premier PGA yearly tournaments has recently relocated to Marana, Arizona, a fast-growing area nestled against the Tortolita Mountains just north of Tucson. This is a paradise for any golfing enthusiast. Billed as the cornerstone of the World Golf Championships, the Accenture Match Play Championship held at the Dove Mountain Ritz Carlton Golf Course in Marana, Arizona attracts the world’s top golfers. It’s a five day match-play event taking place in Marana – just north of Tucson – and featuring a $7.5 million purse. This type of world class sporting event serves to attract more and more golfing enthusiasts. 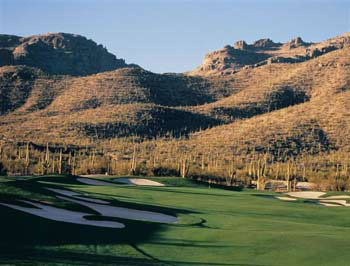 Look for Tucson golf properties to increase in value over the next five years. What better time than now to have the Kai Associates help you invest for the future AND acquire a property near your dream golf course! A Who’s Who’s in golf course design fame could be compiled from the list of Tucson-area course designers. Some of the famous architects included are Robert Trent Jones, Jr., Tom Fazio, Tom Weiskopf, Tom Lehmann, and the “Bear” himself, Jack Nicklaus. This southwest area is heaven for serious golfers! Wherever you choose to live within 60 miles of Tucson in any direction, you are within 30 minutes of a golf course or two. Maybe more! Pick your favorite area and let Kai Associates show you the wonderful golf properties located within your chosen neighborhood. Call us today at 520-616-3426.